I received a package of products from Hive Home to try and tell you about them. Fabgrandpa and I live out in the country in an old farmhouse. 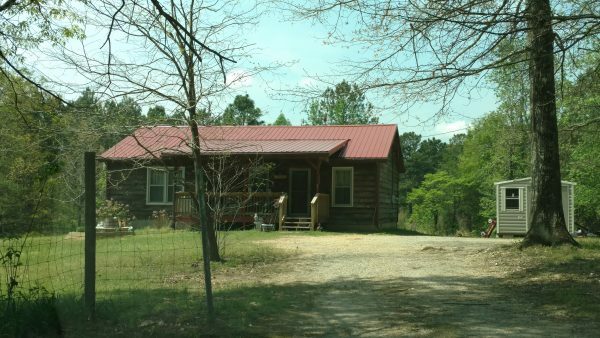 While we do have somewhat close neighbors, we feel secluded on our wooded acreage on a dirt road. Sometimes I feel a little bit alone out here. That is why when I received a package of products from Hive Home that connect my home to the internet, it made me feel a little more secure. Our house in the country. For instance, if I forget to turn on a light when I leave the house, and have to return after dark, I can use my cell phone to turn one on. I never have to walk into a dark house again. When I get home and sit down in my recliner, I can adjust the brightness of the light for reading, using my laptop, or watching TV from the convenience of my phone. You don’t have to live in a huge new home in the city or suburbs to benefit from connecting your house to the internet through the Hive Hub. Hive products can connect your home to the internet. You can program the different products to work together in the ways that benefit you using the Hive App from your smartphone. Turn lights on and off, turn up the heat with your Hive thermostat, turn appliances and lights off just by walking out the door with a Hive Door and Window Sensor. 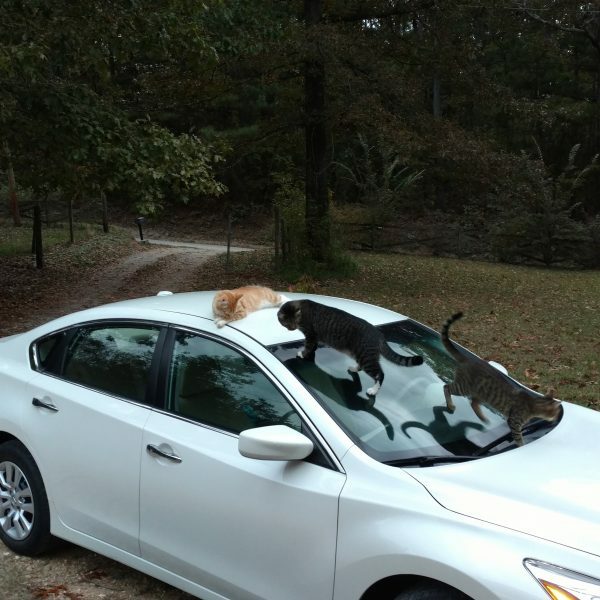 Rosie The Boy Cat, Morti, and Frank playing on my car. Those kitties! I have three cats. Even if the weather is bad, they insist that I let them go outside. During the winter months, I can’t leave the entry door open so I can’t see when they want to come back in. I plan to get one of the motion detectors to put on the storm door. I will program it to turn the light off in the lamp next to my chair. That way, when Rosie The Boy Cat, Morti, and Frank are ready to come inside, I will know to open the door for them. There are so many ways to use Hive Home! 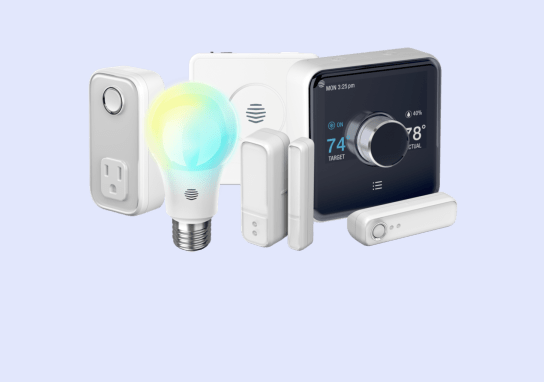 Just think of how you could simplify your home, and then do it with Hive products like light bulbs, motion detectors, thermostats, cameras, and more. Hive works with Amazon’s Echo and Google Home so you can ask Alexa and the Google Assistant to do things for your like turn off all the lights, or turn on an appliance. 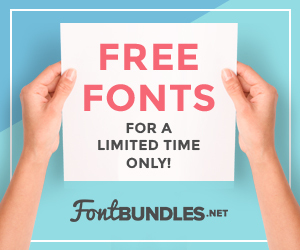 You can get started with Hive for as little as $8.33 per month! 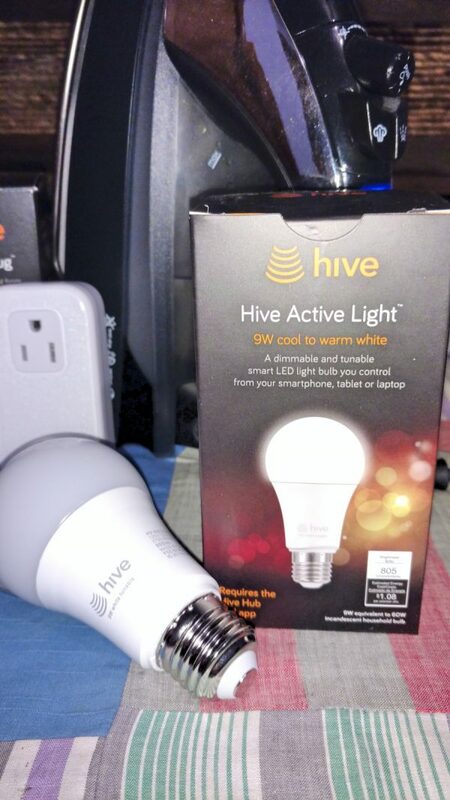 The Hive Starter Pack includes 2 Active Light Cool to Warm White light bulb, 1 Hive Active Plug, 2 Door and Window Sensors, and a Hive Hub. Learn more about Hive Smart Home products and packages here. I have never heard of Hive before but this looks great. I’ve played here and there with Smart Home Stuff and I’m always intrigued to learn about new stuff!